FreshMail is ideal for small to medium e-commerce businesses sending out a high volume of emails. FreshMail is a great option for businesses that want to make sure their emails look, feel and function in a modern capacity. FreshMail is sleek without being off-putting, and the templates are the best in the market — even better than powerhouses like Mailchimp or ConstantContact. When you combine that with a great pricing strategy, a low-barrier of entry for learning and great customer support, FreshMail is there every step of the way to make sure your business is putting its best foot forward with email marketing. The more you put into FreshMail, the more you’ll get out of it, and I highly recommend taking advantage of the free webinars and video tutorials. It’s also important to note that FreshMail’s unlimited sending is a powerful asset for e-commerce businesses or businesses that do a lot of frequent emailing. FreshMail has the best-designed templates I’ve seen on the market. They are gorgeous! Any template you choose will instantly make your brand look modern and relevant in today’s digital-savvy business environment. It has templates for financial services, fashion, schools, tourist agencies, SaaS services and more. It adds new templates regularly, and the support and user community are active. Its feature set is diverse for the cost. It doesn’t restrict any of its services for lower plans, which is a unique approach in this industry. Most services reserve automation and SMS capabilities for higher-paying customers, but you can sign up for free (up to 500 subscribers and 2,000 emails) and send unlimited campaigns, use A/B testing, experiment with automation, use SMS and do much more for free. It’s a really impressive selling point. FreshMail doesn’t slack off with its template offerings. Each template is designed with care by a design professional, and the attention to detail shows. I have yet to see another service match the “out of the box” templates that FreshMail offers. Each and every template, from education to finance, is really impressive and offers a great foundation to build your email marketing style on. FreshMail’s approach to pricing is sharp. Instead of tiering features like most companies do, it lets you sign up for a free trial and get access to the entire platform, and it offers unlimited sending once you start paying. The lowest-price option starts at $14 a month for up to 1,000 subscribers. This is a great choice for small to medium-sized e-commerce businesses that plan on sending a lot of transactional emails. The pricing is easy to understand; you only have to worry about how many subscribers you have. There’s no email limit — you can send out 10 blasts a day to your subscribers if you like. (I wouldn’t recommend that, though.) FreshMail also offers credit options for infrequent senders. FreshMail’s dashboard is really cool. It features a blog stream of helpful articles and information on how to get started. Creating a new campaign is front and center, and the dashboard shows you your most recent campaigns and existing drafts. Also, live support is just a click away. The tools handle well, and the only part that feels a bit overwhelming is the drag-and-drop editor. The content modules are all crammed into the left sidebar, making it a bit convoluted, but that feeling dissipates after you spend a few minutes tweaking one of the excellent templates and taking advantage of the comprehensive training materials. The Google Analytics integration and SMS capabilities are really easy to set up, even if you aren’t a developer. It allows you or your email marketer to handle everything inside FreshMail without outside expertise, helping you spend more time focusing on your business instead of asking questions. But if you do need to ask questions, it offers chat, email and phone support. 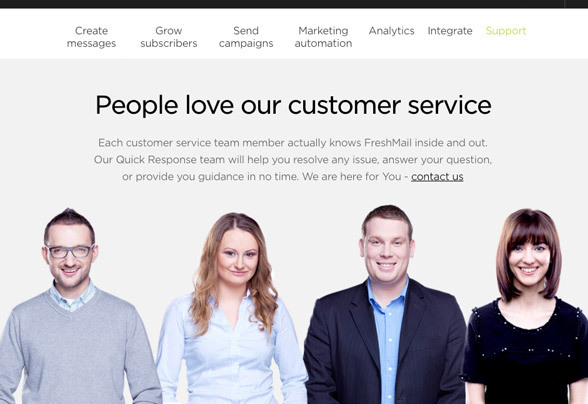 FreshMail prides itself in always being around to help you make your business a success, and the effort shows. Apart from the fantastic design of the templates, FreshMail manages to offer a robust email marketing platform at any price tier. With behavior-based automation features, transactional emails, SMS capabilities, A/B testing and a Google Analytics integration for reporting, you won’t have to look outside FreshMail for any email marketing idea you want to implement. Couple the native features with the friendly API/Zapier, and it’s easy to see why FreshMail is digging into the business of email marketing. The only issue I had with the editor was its friendliness toward HTML edits and the jumbled design of the content module system, but other than that, it handles really well. I encourage you to hop in, watch some videos, join a webinar, and take it for a test ride. 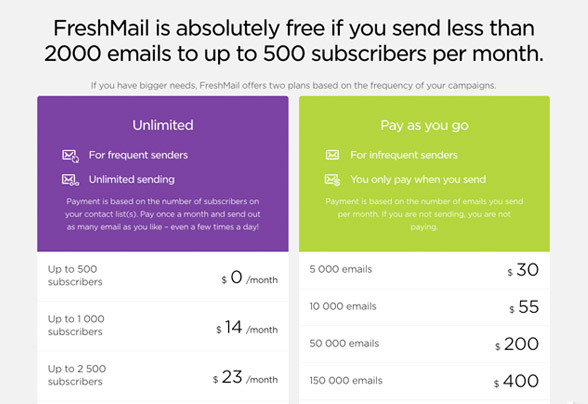 After all, every single feature FreshMail offers is free for up to 500 subscribers. FreshMail’s customer support is really great. It uses its impressive support infrastructure as a way to differentiate itself from competitors such as Mailchimp, and the devotion to this tactic shows via the wide net of support options. First and foremost, FreshMail has 24/7 support so you can get anyone on chat within five minutes, anytime and anywhere. We encourage you to take advantage of this feature. Anytime you feel stuck in the tool or have a question about how to approach an email marketing move, just type it in. It’s faster than searching yourself, and why wouldn’t you want to take advantage of an expert on hand? FreshMail also offers phone and email support during normal business hours, and support personnel answer email within a few hours. The phone support is pretty quick as well. It also hosts free webinars that go in-depth into how email marketing can help your business. If you prefer to teach yourself, FreshMail has a bunch of video tutorials, blogs and white papers that cover everything from getting started with email marketing to the most in-depth email techniques. 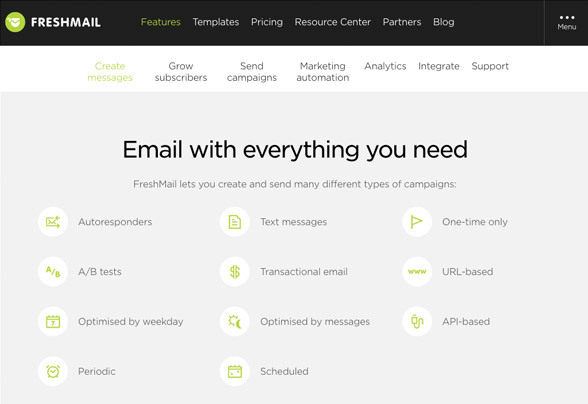 FreshMail offers everything you need as an email marketer and doesn’t restrict features based on price. You can get access to A/B testing, a drag-and-drop editor, mobile-friendly templates, SMS messaging, automation and transactional emails free up to 500 subscribers and 2,000 emails. After that, it’s only $14/month for up to 1,000 subscribers, with unlimited sending, which is a powerful feature for people who send frequent emails. The pricing model is easy to understand, and the support system does a great job equipping businesses with the right tools and training to succeed. It has the best-designed email templates in the business, and if you’re looking for a solution that makes it easy to be digitally professional without a whole lot of tweaking, then FreshMail is for you. 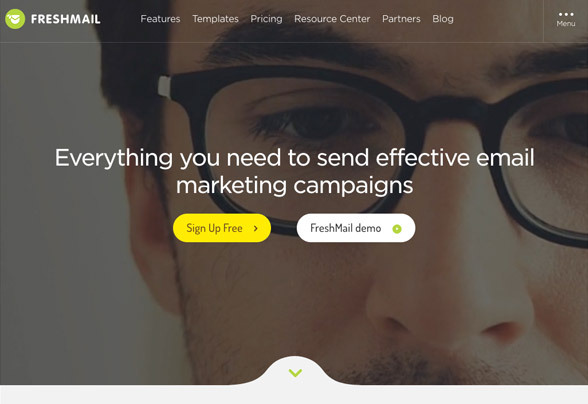 FreshMail, founded in 2008, is a comprehensive email marketing platform with a suite of features and free account options. It services more than 60,000 users and has made a lot of headway in the email marketing space via innovative pricing features and well-designed templates. FreshMail LTD, 88 Wood Street, EC2V &RS, London, UK. Reproduction in whole or in part in any form or medium without express written permission of Natural intelligence Ltd.